Fiction – paperback; Vintage; 309 pages; 2003. Translated from the Swedish by Tiina Nunnally. 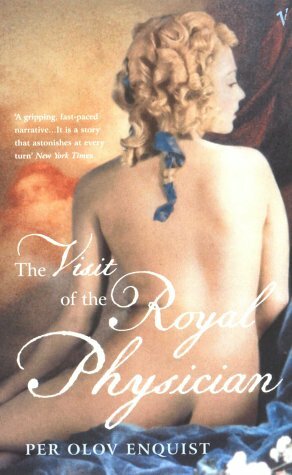 The Visit of the Royal Physician, an historical novel by Per Olov Enquist, is set in Denmark at the height of the Enlightenment. It tells the story of the half-wit king, Christian VII, whose behaviour swings between outrageous violence one minute and confused innocence the next. His advisors capitalise on the young king’s madness to run the country as they see fit, controlling not only the so-called ruler but the nation state as well. This creates many dangerous political battles between rival advisors. To complicate matters further, the king is unable or unwilling to consummate his relationship with his wife, Caroline Mathilde. She then turns to the arms of another and conducts an adulterous affair with Christian’s most trusted adviser, Struensee — the royal physician of the book’s title. It does not take long before she falls pregnant to him, risking scandal and expulsion from the kingdom, which, in turn, threatens to undermine the very stability and security of Denmark itself. All in all this is a dark and somewhat astonishing story reminiscent of Rose Tremain’s award-winning Music & Silence but set 140 years apart. The Visit of the Royal Physician is imbued with the same sense of drama, romance, betrayal and political intrigue that characterised Tremain’s wonderfully mesmerizing book. But Olov Enquist, a Swedish author, has written it as reportage, which adds an extra layer of authenticity to the story. If you like your historical novels to resonate with passion and suspense, you won’t go far wrong with this one. I thoroughly enjoyed it — though Tremain’s foray into Danish history is still the best one I’ve come across.